Blake Harruff is a 2004 graduate of Wylie High School. 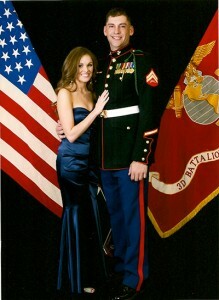 He joined the United States Marines in 2006 after several years of college, and in 2010 was sent to Afghanistan. He was part of the assault on Marjh, a city of nearly 100,000 that was a major stronghold for the Taliban. Blake spent eight-months dodging bullets and bombs and tracking down the Taliban in an attempt to free Marjh and other cities in the area. Harruff spent eight months in Afghanistan, where he had the opportunity to help many people, which was the rewarding part of what was a true nightmare. He said they helped many children and freed many schools from Taliban harassment. Since completing his time with the Marine Corps, Sgt. Blake Harruff returned to Abilene and married fellow Wylie alumni, Chelsey Mathis, a 2006 graduate. They live in the Wylie area and have a little puppy. He is employed with Hendrick Health Club and is planning to complete his studies in Kinesiology at Hardin-Simmons, followed by a graduate degree in Physical Therapy. Harruff’s parents, Debbie and Kirk Harruff, live nearby. He also has a brother, Ryan Harruff, who also graduated from Wylie High School.